I finished up the demo painting of waterlilies on Yupo. The water remained loose and wet/washy looking, while the lily pads were painted with more control. It is a busy, colorful scene, but you can see that you can paint realistically on Yupo. If you don't know what Yupo is, here is a link to my early post: Watercolor on Yupo Paper. The surface of the lily pads were painted in one pass. 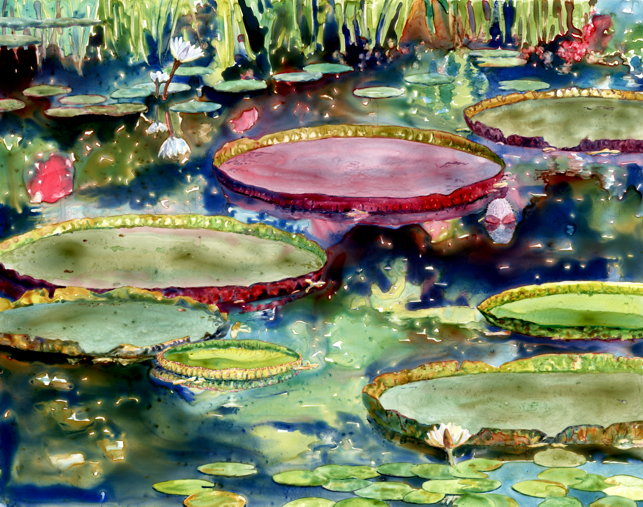 The edges of the lily pads have two or three glazes on them and some detail of veining or texture. To finish this piece I will spray it with 4 coats of an archival acrylic sealer and then mat and frame it. Wow, that is beautiful. I love the reflections! Really "sparkly"! No one does lilies as beautifully as you do! Your yupo painting turned out wonderfully...those lily pads really seem to be floating. I did start a small piece and it isn't working for me. I believe I know the concept, but think yupo works best with water being part of the subject. This one is a keeper! Thanks for the great comments! Johanna, I do like Yupo for water, but it also works well with snow scenes and for close ups of flowers where the background is blurry. This is a beautiful painting. So full of color and saturation. I found you via Art Blogs 4 U, and I look forward to seeing more of your work. "This is a beautiful painting. So full of color and saturation. I found you via Art Blogs 4 U, and I look forward to seeing more of your work." Thanks so much! Something happened with posts when Blogger was doing some maintenance. Yours got to my email, but got lost on my blog. Yupo paper is great for bright strong colors and a fun break from my normal paper Arches 140lb cold press. Thanks for your kind words Yevgenia, glad you enjoy my blog!